Superbe Cottage récemment rénové se trouve à droite sur la rive du Long Pond! Une destination de vacances classique du Maine! Ernest Thompson est resté sur Long Pond tout en écrivant son jeu 1979 "On Golden Pond". Nous sommes situés sur la rive sud de ce fameux lac, et vous pouvez prendre dans l'une des plus belles vues sur le lac de notre grand porche d'écran ci-joint. Ce chalet dispose d'une chambre principale avec salle d'eau ci-joint, une chambre à coucher au bord du lac avec un lit king-size qui peut être converti en deux lits jumeaux et un canapé-lit queen canapé pour une personne ou un enfant supplémentaire. 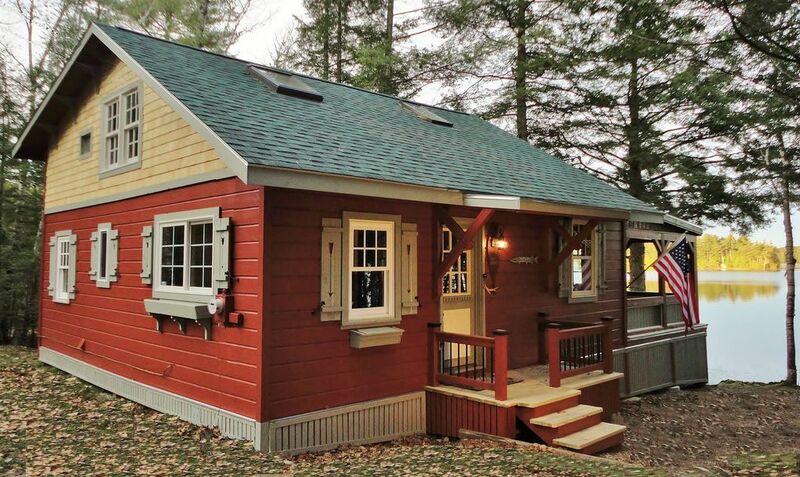 Chaque aspect de ce chalet a été conçu et construit pour créer un look unique qui ne est pas facile à trouver. Notre établissement est situé dans un endroit calme, loin de toute les routes achalandées, mais à proximité des villes pittoresques de vacances Belgrade Lakes et Mt. Vernon, où restaurants et des commerces sont disponibles. Lacs de Belgrade sont célèbres pour leur qualité de pêche et eaux cristallines, idéales pour le kayak ou la navigation de plaisance. Nous offrons une grande piscine, de votre propre quai et plateforme de bain, et bien sûr une connexion Wi-Fi gratuite. We spent a week here in prime leaf-peeping glory and it was perfect! The cottage is well-appointed, very clean, and boasts a gorgeous view of the pond. Enjoying morning coffee on the screened porch and relaxing with a glass of wine by the fire pit at sunset were highlights. We took our dogs hiking on nearby trails every day and had fun exploring the Lakes area. The owners were responsive, kind, and left detailed instructions including restaurant recommendations and other helpful tips. We liked the seclusion of the cottage - truly felt like we were on vacation! We hope to come back next year! My husband, our son Mike stayed at the Cabin for 3weeksOur granddaughter and her little son came for a week. We had the best time in this beautiful cabin.Our dog Jesse loved the lake and dock to jump right in the water. BEST PLACE EVER.We would like to come again next year.George, Gisela and Jesse. We spent the second full week of June 2018 at Scott and Loraine's cabin on Long Pond. I cannot think of enough superlatives to describe our experience with both the owners and the property itself. The cabin was the perfect size for us, decorated quaintly and was very comfortable. The location directly on the water is literally breathtaking each and every time you look out the upstairs bedroom window or step onto the screened in porch. The water was steps away. We rented a couple of kayaks for the week and enjoyed paddling around the lake. We hiked some local trails and got some beautiful photos of the lake from an eagle's eye view. We also braved the early June chilly water and took a couple of dips and hung out on the swimming dock and enjoyed the warm sun. The cabin is physically located in a great spot for people like us who like to have a single central location and take lots of day trips during the week. Have been to Belgrade Lakes area many times since childhood and have never enjoyed a cabin as much as this one. We will be returning! The house was very comfortable and had everything we needed. We had perfect weather and the leaves were amazing. Great time to visit Maine. Sitting on the dock was my favorite!!! I would recommend this property to our friends. Good communication with owners. Thank you! Another wonderful stay at this amazing cottage. Views are perfect, it's away from all the hustle and bustle, secluded, clean and quaint. I come from Mass every year to this lake to enjoy the serenity and fishing, There's no doubt I will always book at Loon Song and with Scott for good reason. This cottage is lovely, what a well done remodel! The screened porch is fabulous -for morning coffee, for doing a jigsaw puzzle, for having an evening night cap- beautiful view and great soundtrack of loons singing! You really did it right when you made the screened porch- lots of space, comfy furniture and cozy blankets for when it is chilly. The cottage is set near the end of a dirt road, nice quiet roads for taking walks. The water was slightly busy with boat traffic on the weekend but it quieted right down come Monday. It was great watching the loons, herons and geese on the water. Also great to have a campfire and watch the stars at night. Thank you for sharing you cottage! Most rental amounts broken down into two or three payments, with the final payment due NO LATER than 30 days prior to your scheduled date of arrival.